To tip or not to tip? When dining in a foreign country, that is often the question. In Singapore, the short answer is no – the country does not have a tipping culture. For the long answer, keep reading. Restaurants & bars: If you’re eating or drinking at the kind of place where a server comes to your table, a 10% service charge will automatically be added to your bill. This is usually illustrated by the symbols “++” after prices on the menu (meaning “plus service charge and taxes”). Even if you have excellent service, a tip in addition to this amount is not expected, but would be appreciated. There are a few exceptions. Brewerkz at Clarke Quay, for instance, opts to not charge a 10% service charge. That said, these tend to be restaurants where a large percentage of customers are expats or tourists who are accustomed to tipping more than 10% anyway. 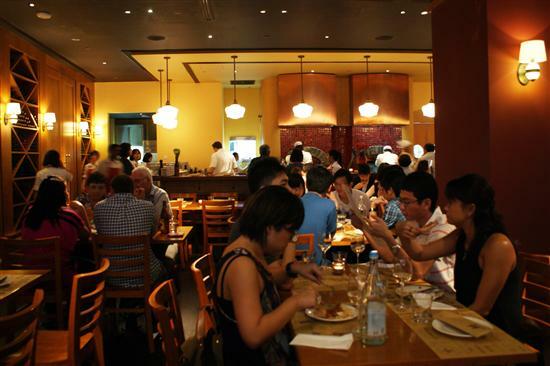 A 10% service charge is added to restaurant bills in Singapore. Hawker centres: I’ve hosted friends from the USA and Canada who have wanted to leave a tip at a hawker centre. I can understand why – someone just cooked the best noodles they’d ever eaten and only charged $3 for it – but tipping at hawker centres is definitely not the norm. Of course, everyone likes to know they’ve done a good job, so give a smile and compliment to the chef instead. Hotels & guesthouses: A 10% service charge is automatically added to room rates at most hotels in Singapore. The only places to stay that don’t have this surcharge are hostels and some budget hotels. In theory, this amount covers the services of the doorman, porter, concierge, and anyone else who makes your stay easier. Of course, these are not lucrative jobs, so if someone goes out of their way to help you, feel free to reward them. For porters, an amount of S$2 per bag is reasonable. Taxis: Taxi drivers in Singapore do not expect a tip. In fact, if your fare is S$9.80 and you pay with a S$10 bill the driver will automatically start reaching for the change. Changi airport: The services at Singapore’s Changi Airport will almost certainly exceed your expectations, but airport staff are actually forbidden from accepting tips.